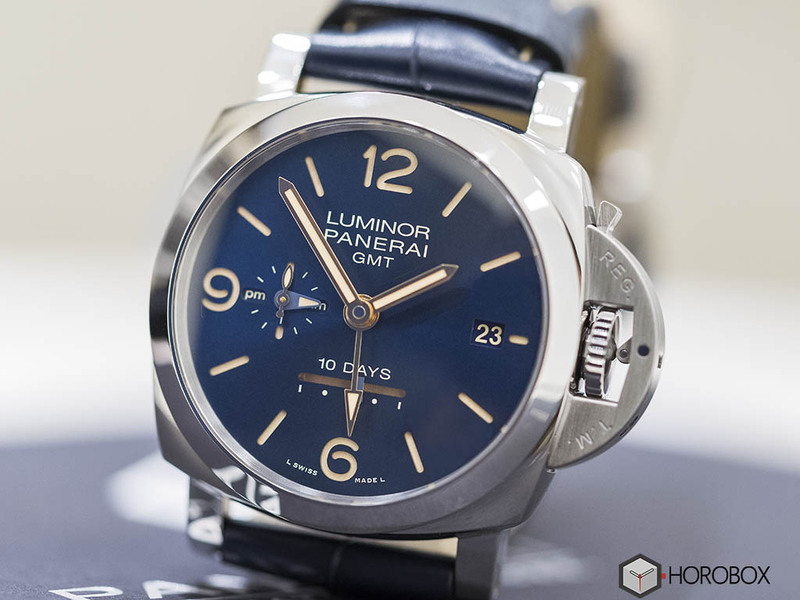 Hands On with Panerai’s recently released timepiece PAM00689 featuring a strikingly beautiful blue sunray dial and a fairly increased price tag. 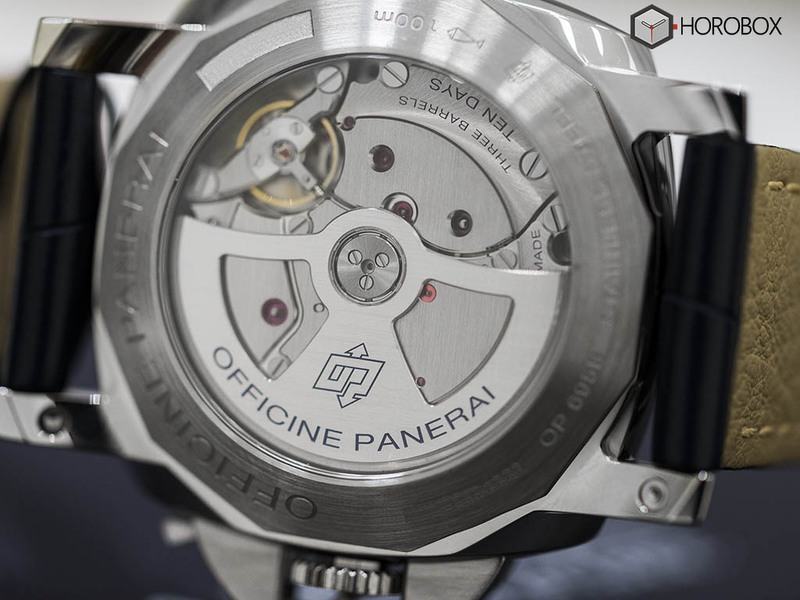 Officine Panerai was an attention grabber with its in-house movements when Swatch Group has not staked for supplying ETA movements to non-group member brands yet and the stores were full of different models powered up with ETA 2824 and Valjoux 7750 movements. 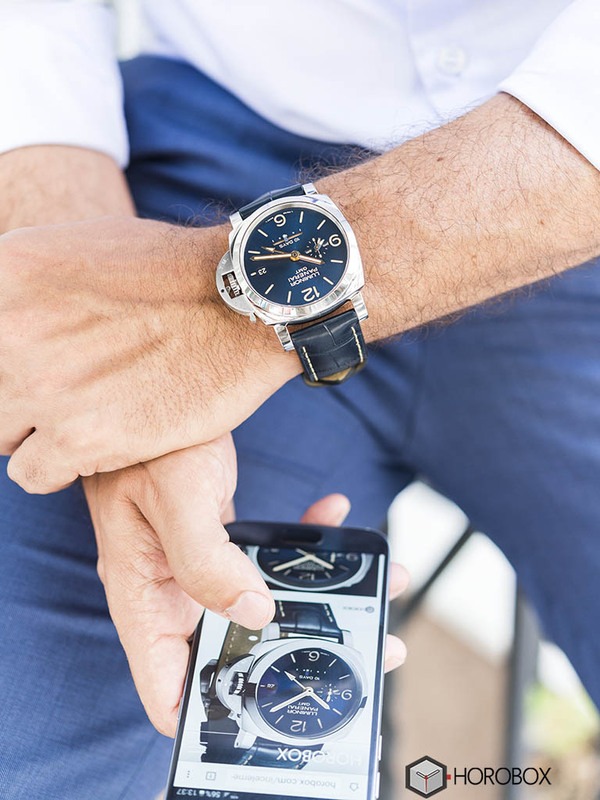 The P.200X movement line was so coherent with the brand’s DNA back when it was first released as the harmony of Panerai’s simple design philosophy and the complication itself was a heavenly experience for Paneristi. PAM00233 and the similar PAM00270 powered up with an automatic movement were the kind of models which could easily be the “ one watch nirvana “ piece for many watch enthusiasts. 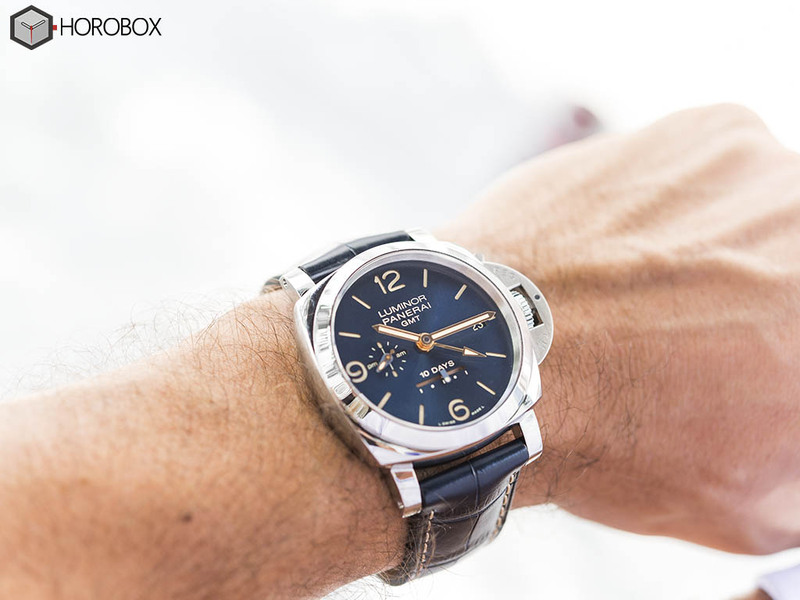 It’s been a long time now and we are expecting revolutionary novelties from Panerai. However, all we got is a blue color and a beefed up MSRP. Basically, PAM00689 is a limited edition and a blue dial version of PAM00270. PAM00270 is discontinued for the favor of PAM00533 with aged tone indices. PAM00689 is offered in a 44mm case made of stainless steel. 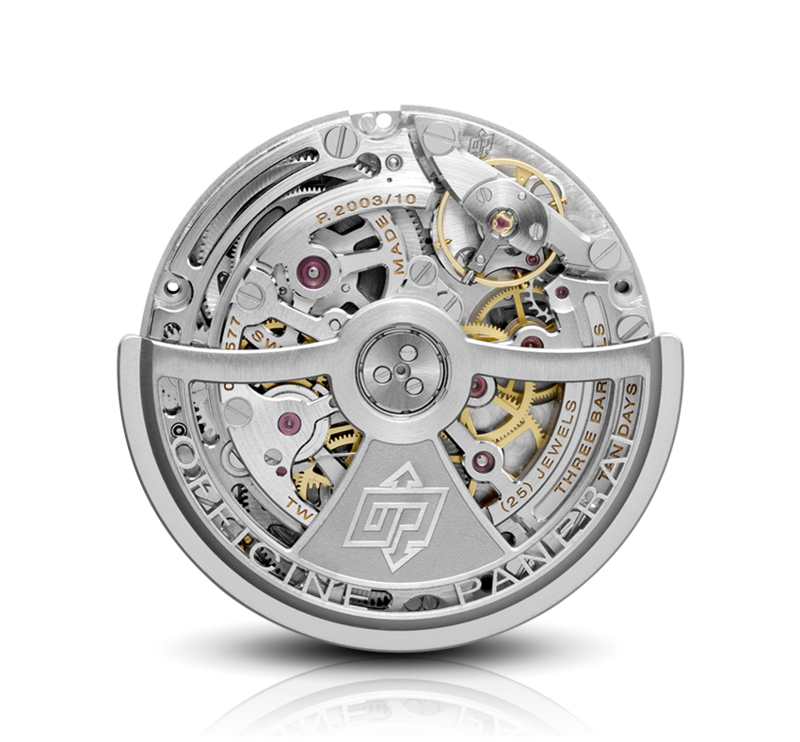 The case features a remarkable thickness due to the complicated movement. With the addition of the thick caseback and the highly domed sapphire crystal on the front side, this thickness issue get even more felt when wearing the watch for a long time. I would not call it the most comfortable watch ever for obvious reasons but, I might say that it’s pretty comfortable and well balanced despite its hefty design. The watch is water resistant up to 100 meters with its double sapphire crystals. 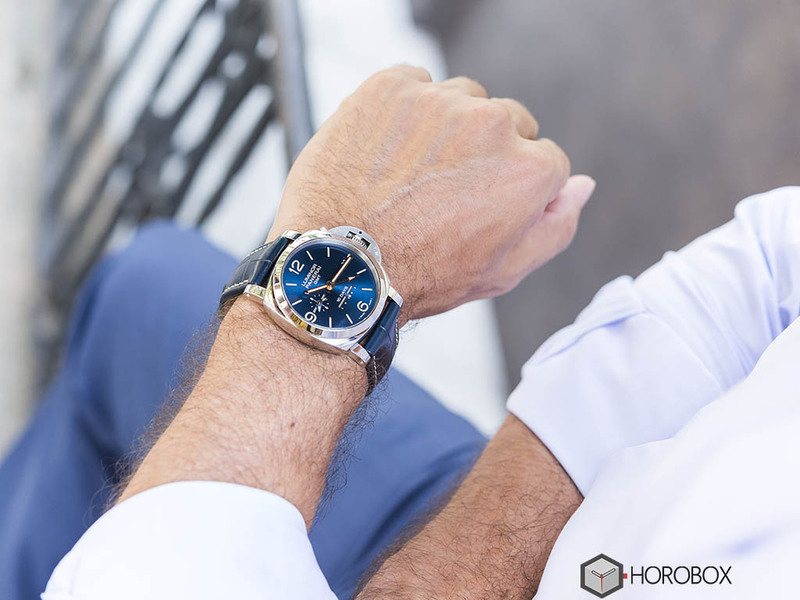 Generally Panerai Luminor 1950 case design is appraised for its sporty character however, this timepiece looks more like an elegant watch which is quite possibly due to its blue dial. The watch features the tested and approved automatic movement Caliber P.20003.10 with 10 days power reserve and 28800vph beat rate. It may seem a bit useless at first but, 10 days power reserve is a very handy feature for user with a number of watches in their collection. Thanks to this feature, watches which barely worn once in a week can be used without any re-setting. The power reserve of the movement can be monitored through the linear indicator on the dial. PAM00689 also features a GMT hand which completes two full rotations per day unlike the conventional GMT featured watches with one full rotation per day. Day/Night indicator is located under the small second hand. If you are bothered with the busy look of the dial, the GMT hand can be hidden right under the hour hound. The date setting is a little tricky like other GMT models. Moving the date disk to the desired setting instead of a quick set date function can be boring sometimes. Again, 10 days power reserve saves us from this task. Speaking of 10 days power reserve, the accuracy of the watch tends to get less in accordance with the power reserve. Therefore, users who seek for utmost accuracy should better keep the watch well wound. And last, the second hand stops and resets to zero when the crown is pulled for setting time. PAM00689 comes on a matching blue crocodile strap and a stainless steel buckle. It is hard to say the strap is comfortable at the first use but we are sure that it’s going to get better in a short while. The use of aftermarket straps is always an essential point however, we believe this is going to be a bit limited due to the blue dial. 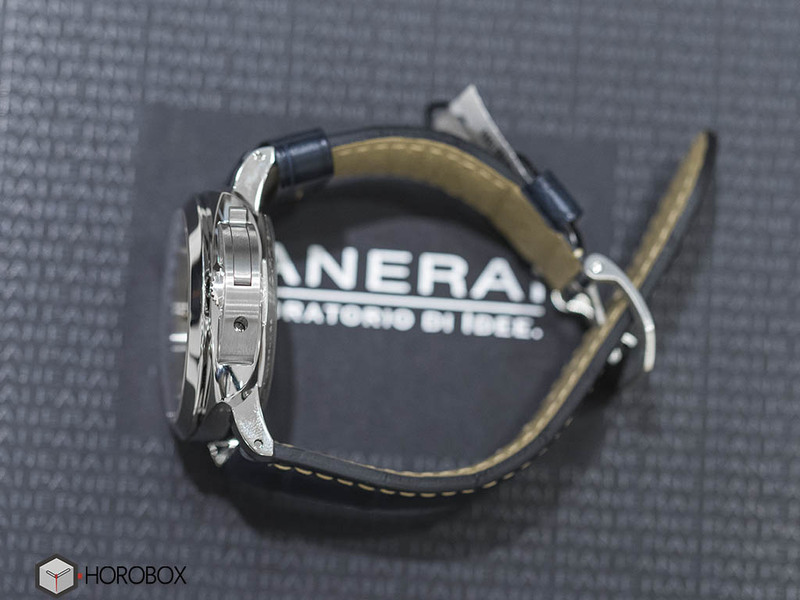 Panerai offers fully padded straps for the regular buckles. The folding clasp models are offered with relatively more comfortable straps. Therefore I would suggest you to get the crocodile straps with the folding clasp. Of course, this preference will be reflected to the buying price. 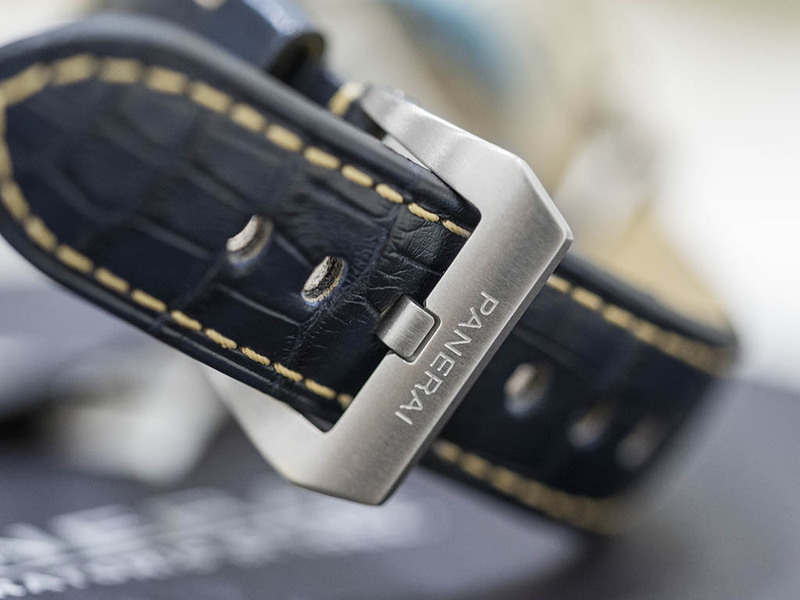 The strap change system is the standard one with all modern Luminor 1950 cases with spring buttons. 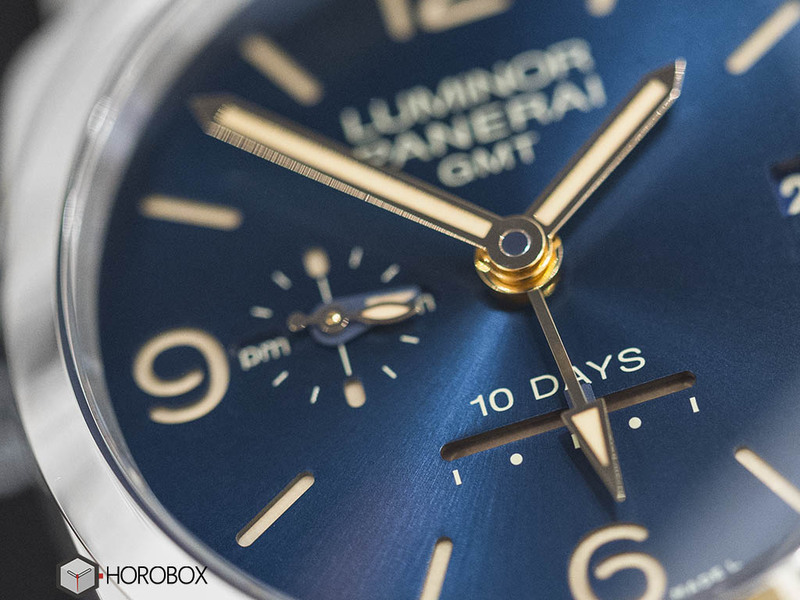 The dial is finished in sunray form which provides different tones of blue under certain angles. The harmony between the vintage tone SuperLuminova and gold hands is stunning. PAM00689 will be limited to 300 pieces only and will be sold for 13.000,00 EUR. If it was many years ago, I would say hurry up and get one while you can but, considering the relatively high MSRP and the presence of nicer priced alternatives, I would not. If the price is not an issue then I would strongly suggest this “Blue dia..!” limited edition timepiece from a brand like Panerai.